Since 1763 the name 'Russborough' has been synonymous with collecting and dealing in fine art. In the closing decades of the last century the historic town of Port Hope has become home to Lord Russborough's Annex, which specialises in an individual mix of antique maps, paintings and prints. While Lord Russborough's Annex features a great many works of museum calibre, we also offer a wonderful selection of prints priced at under $100. Proof before text. 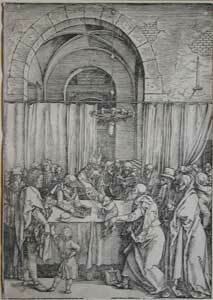 Original Woodcut, 1498 A fine clear impression on oatmeal coloured linen rag laid paper trimmed to approx. 2mm. border all around. Signed with monogram in the block. With a clear Tower, Crown and Flower watermark. Small area of weakness to paper by Devil’s left shoulder. Minute chip to 2mm.border (3” from top right and 5 ½” from bottom left), tiny 1 cm. repair and strengthening to back of image (7 ¾” from bottom right). Museum matted, glazed, giltwood frame. Click for more information on the printing technique. The greatest printmaking achievement of Dürer prior to 1500 was The Apocalypse, a set of 16 woodcuts (inc. title) on the biblical book of Revelation of Jesus Christ to St John. (Rev 20.1-3, 21.9-12). Telling the story of the end of the world and the coming of the Kingdom of God, at a time when many thought the Last Judgement imminent. This, the final image in the series depicts the ending of the war between Heaven and Earth the devil is about to be locked away for a thousand years. The sky again abounds with birds (as opposed to sword-wielding Angles & Demons). On the hill top an angel points the weary St. John toward the 'New Jerusalem', Christ's kingdom on earth, which lies ahead, its gates guarded by other angles. To emphasize the proximity of these events Dürer depicts the city as a Franconian town, a Nurenberg-by-the-sea. This series of large prints displays great imagination and power and transformed the medium of woodcut, and influenced the later treatment of the subject in northern Europe, especially France. Watermark: Tower with crown & flower blank on verso. Woodcut. ca.1580? Executed for The Life of the Virgin, Trimmed to thread border all around. Printed on thin oatmeal coloured chain laid paper. Signed with monogram in the block. This impression from ca. 1580 is printed with an unidentifiable watermark, [but possibly a Sword hilt]. Small flaws to bottom border and minor repair to bottom left. The Ms.numeral 13 has been added in graphite below Dürer’s monogram. Original Poulsen Galleries, Pasadena framing lable has been preserved on verso of frame, Museum matted, glazed, giltwood frame. First published in 1503/04 as one of the series of images portraying the Life of the Virgin. The first complete edition (with a Latin text by Benedictus Chelidonius printed on the verso of the prints) was published in 1511. The Traditional and Legendary scenes are those taken from the apocryphal Scriptures, some of which have existed from the third century. The Golden Legend of Joachim and Anna, the elderly parents of the Virgin, with the account of her early life, and her Marriage with Joseph, down to the Massacre of the Innocents, are taken from the Gospel of Mary and the Protevangelion. 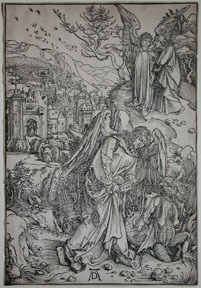 One of Dürer's masterpieces, the print illustrates within the interior of a temple the High Priest refusing the offering of a lamb that Joachim the priest, has laid upon the alter, because he and his wife Anna, who are to become the parents of the Virgin Mary, are barren, a sign that they must have been rejected by God. The woodcut chooses a very ironic Biblical moment in which the wisdom of man was shortly to shown to be false. Notice his servant carrying the lamb for sacrifice.